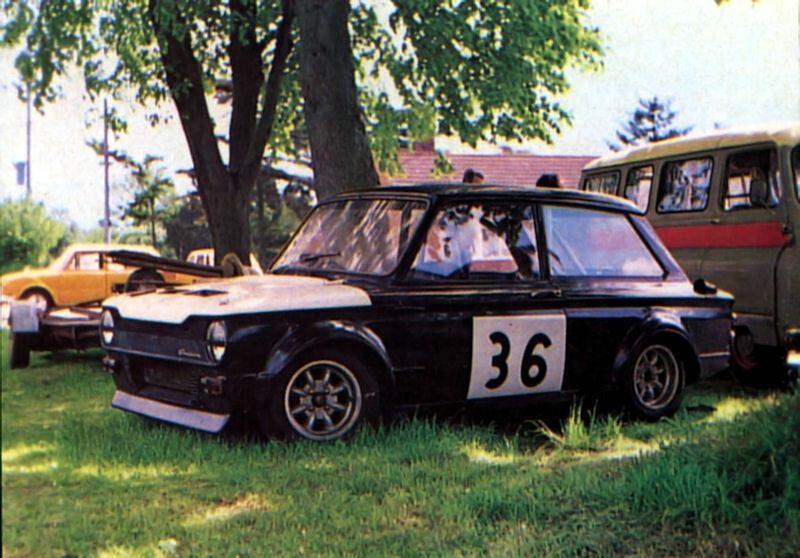 Five months' hard work went into this car and transformed it into a racer from its original guise as a 1967 Imp Sport. The owner is Mr Lavis of Pewsey in Wilts, and all of the work on the car was carried out by him over last winter. The suspension is set up very hard and the Armstrong shockers are on their top setting, but some Konis are in line for next year. The brakes are standard with the exception of harder linings, but we are told they are perfectly adequate for racing on the shorter circuits. Tyres are intermediates on 6½J rims, but this too is to change with slicks on 10J rims being substituted. Carburation is by courtesy of Weber 40DCOE's. The compression is around 12:1 with 1.4 diameter valves and an RP3 cam; the whole ensemble putting out between 110 and 115bhp at 8,600 revs, courtesy of Hartwell. By racing standards the car is still very heavy. The only lightening so far carried out involves the fitting of a glassfibre bonnet in place of the original. But this too may well be changed. All things considered, the car is well screwed together, quite pretty, and competitive as well.